The Okavango Delta in northern Botswana is a land of contrasts in landscapes and seasons, for it is here where the seasons are unlike anywhere else on the continent. The Okavango Delta in Botswana is renowned around the world for its pristine nature and its prolific wildlife but what few people understand are the fascinating contrasts between the seasons, where colours of dry season brown contrast with the time of the highest water levels and the lush greens of the wet season clash with the black mud pans left dry by the receding floodwaters. Truly one of the natural wonders of the world, the Okavango Delta is a place of extreme contrasts during any season of the year with its lowest water levels happening at the start of the wet season and the highest levels at the peak of the dry season. Viewed from the air the landscape shows a fascinating patchwork of islands and floodplains of varying shapes and sizes, the white Kalahari sand of the islands contrasting deeply with lush floodplains of grass and water. The sight of herds of animals or flocks of birds passing by adds to the incredible scenes below. The islands that dot the Okavango landscape are formed in numerous ways, by termites or by a build up of detritus from the flowing water, but all show the white Kalahari sand they were built from. This contrasts starkly with the clear blue water and green fringes of the dry season and the lush green colours of the rainy season. Heading further north towards the permanent waters of the Okavango Delta the contrasts are just as dramatic as on the seasonal floodplains, instead here it is the vegetation and water that characterises the contrasts. The permanent delta is a landscape patterned in channels, lagoons, forested islands and papyrus stands. The colours that characterise the permanent delta range from shades of brown to colours of green, with the dash of white Kalahari sands of the islands to add to the mixture of a fascinating tableau of contrasts. The contrasts of this fascinating region can be experienced on any visit to the Okavango but as most the lodges in the delta are set in remote locations, air travel is the only means of access. This allows visitors the opportunity to experience the Okavango contrasts from the air. 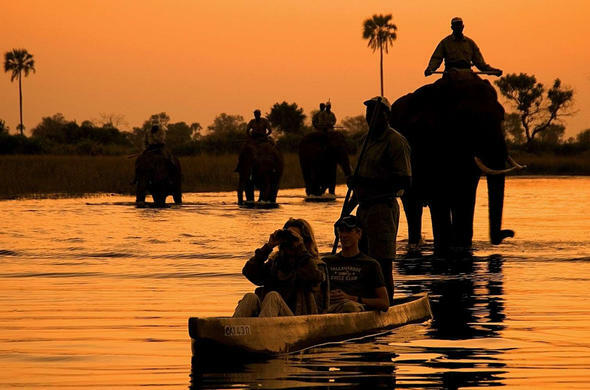 Unfortunately many guests view the flights merely as means of getting from one place to the other, thereby missing an intimate part of the Okavango safari experience.